Why did I decide to date a triathlete? Seriously. I am not a runner, I can't stand cycling, and heart condition took me out of the pool. But at least once a month, I'm accompanying my beloved to one of his races. I outweigh him by about 40lbs, and it's driving me nuts. So, I thought out of the three sports, I should at least be able to start running again. 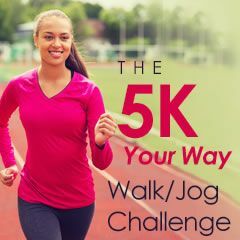 So here I am, hoping to join all of you in your quest to run a 5K. I look forward to interacting with everyone, and supporting you in achieving your goals!